An orca at SeaWorld's park in Orlando, Florida, jumps out of the water. There are currently 10 orcas living in captivity in California, according to Assemblyman Richard Bloom's office. State Assemblyman Richard Bloom (D-Santa Monica) is determined to end the use of orcas for water shows in California, where the whales jump through hoops, for example, or carry trainers on their backs. Bloom has just introduced legislation that would ban people from keeping orcas in captivity for entertainment purposes, while still allowing research with the animals. The bill also bans the breeding of the whales in captivity and requires that orcas currently held for entertainment purposes be returned to the wild if possible, or to a sea pen when not. SeaWorld, a major player in the marine animal park industry with parks in San Diego and Orlando, Florida, is readying for a battle over the proposal. The water park recently hired a lobbyist and issued a written statement decrying Bloom's bill. The statement argues the bill is being pushed by "extreme animal activists" some of whom "partnered with PETA in bringing the meritless claim that animals in human care should be considered slaves under the 13th Amendment to the U.S. Constitution — a clear publicity stunt." The statement asserted that SeaWorld engages in "business practices that are responsible, sustainable and reflective of the balanced values all Americans share." KQED's morning talk show Forum recently provided a preview of the debate, in a program featuring Dave Phillips, executive director of the Earth Island Institute and Billy Hurley, past president of the Alliance of Marine Mammal Parks and Aquariums. 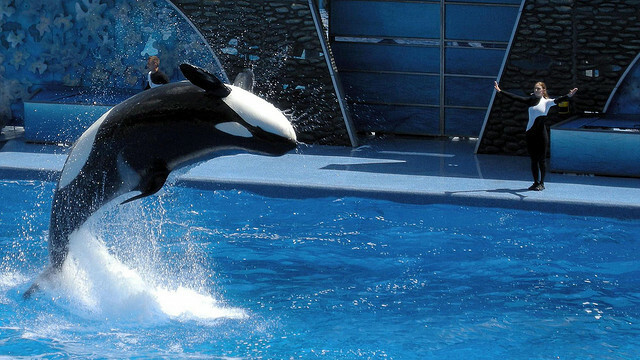 Phillips and Hurley disagreed both about the treatment whales receive in parks like SeaWorld, and about the scientific benefits of having orcas in captivity. Both guests acknowledged that observing the animals in the wild is necessary for scientific research, and Hurley went on to say that interacting with the whales in captivity allows for a deeper understanding of the animals. "What we learn in the wild is how [orcas] do what they do," Hurley said. "What we do with the animals in our care is find out the actual ways they do what they do — things like hearing, nutrition, thermoregulation." Assembly Bill 2140 does allow orcas to be "held for rehabilitation after a rescue or stranding, or for research purposes" with the provision that the whales shall be "returned to the wild whenever possible." One of the central questions in the debate is whether it's necessary to use orcas in performance in order to educate people about the whales and bring in adequate funding to provide for their care. Phillips pointed to the Monterey Bay Aquarium as proof that parks and aquariums can be successful without having orcas in captivity. "The evolution of these parks and the evolution of zoos and aquariums is in the direction of non-performance," he said. "[The Monterey Bay Aquarium] had to confront the paradigm that said 'You can't make this successful without having orcas and without having dolphins.' And they said, 'That's not correct.' They actually have no performances, no cetaceans, and there are people lined up out the door. They're making huge amounts of revenue from a non-captive environment." Bloom's legislation would also require that orcas previously held for entertainment purposes be "rehabilitated and returned to the wild where possible" and moved to a sea pen when release is not an option. Though some may interpret this as an eventual death knell for parks like SeaWorld, the Earth Island Institute's Phillips said that doesn't have to be the case. He cited the millions of people who visited the Oregon Coast Aquarium to witness the rehabilitation efforts of Keiko, the whale who played Willy in "Free Willy." Marine Mammal Parks past president Hurley, however, said the sea pen is a false promise. "It's very easy for some of the extremists to say things like, 'Oh, if we had a sanctuary, if we had a sea pen, it would just be so much different.' And the reality is that if you had a sea pen, you would still need veterinary care, you would still need qualified people to take care of the animals, you would still need to be careful about those types of environmental changes that could occur while the animals were in those conditions. The list goes on and on. And when you end up describing, most importantly, the need to fund such an endeavor, you end up describing a SeaWorld." The bill will likely be introduced into the Assembly Water, Parks and Wildlife committee next month.